What do currency valuations mean for investors? Many South African investors were recently introduced to Nomura Holdings Inc.’s new iPhone index which will most likely herald a brand new catchy acronym such as Ii or I2 (but we’ll leave that to the creatives to pronounce). For those not so familiar with the newly established index, it compares the price of the Apple product across the world in order to determine purchasing power parity across countries. A similar, well-known index established by The Economist in 1986 – the so-called “Big Mac” index – has provided information on currency valuations using the McDonalds burger as the base product for comparison. Both indices compare their base product prices in the comparator country in US dollars to determine if that currency is over- or undervalued. For example, if an iPhone acquired in South Africa costs (in US dollar terms) more than the same product in the US, the local currency is said to be overvalued in comparison to the US dollar. One would expect, then, that these two indices should result in similar conclusions, but that is not the case. 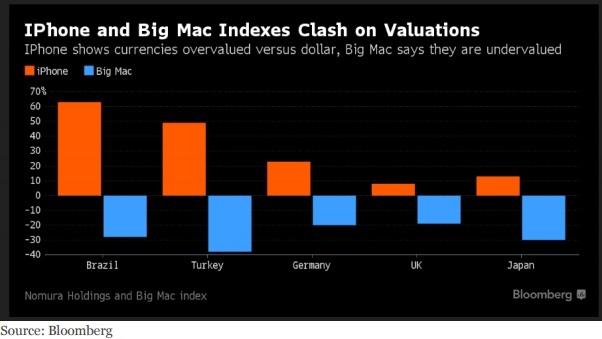 The iPhone index suggests that the US dollar is undervalued relative to other global currencies whereas the Big Mac Index suggests the alternative. The validity of the indices is not under scrutiny as both incorporate different factors: the Big Mac Index effectively measures the input costs to produce the burger “from scratch” locally; whereas Apple’s product hardware is acquired from several countries, assembled in the Far East, transported to another country, and had duty applied. The real question investors should be asking is: what does this mean for me and my family? What should I consider with respect to investing? And should I acquire foreign currency as an investment holding within my portfolio? A well-qualified financial advisor can assist in deciphering what is best for you and your portfolio. There are many variables to consider when looking to invest offshore. First and foremost, forex values can be highly volatile, making them “high risk”. As you see in graph 2, an investor who acquired US dollars with rand in January 2010, and remained in cash without further allocation into investments, would have earned roughly 93.58% in currency appreciation by July 2016. But the rand lost 34% of its in value in 2015 before strengthening 14.41% this year. The question is: would you have been able to stomach the dramatic swings in the performance of this asset class over the past three years? After “what” to purchase, the next consideration is “how much?” and “when”. Acquiring forex in small increments is costlier than one might think. Forex dealers charge a premium on the spot price for their services as well as a service fee to finalise the transaction. Various bank charges are levied, not only to establish the account but also to transfer the funds to the offshore account. All these charges are then repeated when repatriating the funds. Depending on the total forex acquired, these charges and costs may represent a significant percentage which needs to be made up by the currency movement (i.e. the return on the investment). The smaller the sum acquired, the greater the percentage the costs represent. For example, transferring R2,000 monthly could incur an all-inclusive transfer cost of R750 which represents a hefty 37% in fees. To cover this cost, the investment would have to show extraordinary performance. In this case then, transferring more money at any given time is better. Finally, before transferring large sums across the border, you should be aware that there are some limitations. A person over the age of 18 is permitted a discretionary travel allowance of R1,000,000 per annum, while those under 18 are permitted up to R200,000. For tax payers in good standing an additional R10,000,000 per annum may be applied for through your bank, which allows funds to be transferred outside the Common Monetary Area (CMA: Lesotho, Swaziland and Namibia). Once invested, the funds would generate income in the form of interest, rent or dividends and, if sold, potentially incur a capital gain. 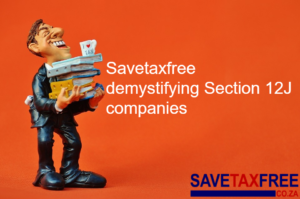 Investors must consider the tax payable on the income as well as on any capital gain. Prior to 1 January 2013, tax was payable on both the capital gain on the asset value appreciation as well as on the currency effect which, in many cases, was enormous. Today, however, the asset value gain is calculated irrespective of the currency one is invested in and is then multiplied by the spot price on the date the asset was sold. This change has significantly reduced the amount of information that one needs to maintain across the term the asset is held. However, with many reserve banks globally in search of inflows, you should include all gains made abroad on future tax returns. For investors looking to externalise funds, currency levels should play a big part in the decision process as the rate at which forex is acquired sets a hurdle in one’s mind when investing. However, it is important to make offshore investments for the right reasons (such as access to alternative sectors and geographic diversification) and to ignore the currency effect when evaluating performance. As the graphs indicate, currencies are volatile and this will impact on offshore investment performance. Consider, too, the costs, goals and strategic aims of your portfolio.